Werner's Cairns blog: When the car become a status symbol. When the car become a status symbol. We go back to the 1920s when the car also started to become the new mode of transport. Below is an amusing true story well worth reading, and a few good chuckles are guaranteed. It is about the time when cars in USA started to become a status symbol. In Australia the trend for the family car only started to take off in 1950s. The manufacture of the first all-Australian motor vehicle in 1948 not only signified an important moment in the country's industrial development it also produced a brand of vehicle - the Holden – (part of the General Motors USA stable) that occupies a special place in the hearts of many Australians. Many of you could probably relate to the story below, when others had a car, but not your family. With all the troubles in this world today, and everybody is struggling to make ends meet there is not too much to cheer us up those days. The following true story may just give you temporary relief from your daily stress and put a smile on your face. There is also a lesson for us in this story. If you need just a bit more than just a smile then see how they test waterbeds in Germany at the end of this story. My brother, David, was born in 1935, and I was born in 1938, and sometimes, at dinner, we'd ask how come all the neighbours had cars but we had none. "No one in the family drives," my mother would explain, and that was that. But, sometimes, my father would say, "But as soon as one of you boys turns 16, we'll get one." It was as if he wasn't sure which one of us would turn 16 first. But, sure enough , my brother turned 16 before I did, so in 1951 my parents bought a used 1950 Chevrolet from a friend who ran the parts department at a Chevy dealership downtown. It was a four-door, white model, stick shift, fender skirts, loaded with everything, and, since my parents didn't drive, it more or less became my brother's car. Having a car but not being able to drive didn't bother my father, but it didn't make sense to my mother. So in 1952, when she was 43 years old, she asked a friend to teach her to drive. She learned in a nearby cemetery, the place where I learned to drive the following year and where, a generation later, I took my two sons to practice driving. The cemetery probably was my father's idea. "Who can your mother hurt in the cemetery?" I remember him saying more than once. He retired when he was 70, and nearly every morning for the next 20 years or so, he would walk with her the mile to St. Augustin's Church. She would walk down and sit in the front pew, and he would wait in the back until he saw which of the parish's two priests was on duty that morning. If it was the pastor, my father then would go out and take a 2-mile walk, meeting my mother at the end of the service and walking her home. If it was the assistant pastor, he'd take just a 1-mile walk and then head back to the church. He called the priests "Father Fast" and "Father Slow." After he retired, my father almost always accompanied my mother whenever she drove anywhere, even if he had no reason to go along. If she were going to the beauty parlour, he'd sit in the car and read, or go take a stroll or, if it was summer, have her keep the engine running so he could listen to the Cubs game on the radio. In the evening, then, when I'd stop by, he'd explain: "The Cubs lost again. The millionaire on second base made a bad throw to the millionaire on first base, so the multimillionaire on third base scored." As you get older, your eyesight worsens, and you can lose your depth perception, it said. So your mother and I decided never again to make a left turn." "What?" I said again. "No left turns," he said. "Think about it. Three rights are the same as a left, and that's a lot safer. So we always make three rights." "You're kidding!" I said, and I turned to my mother for support. "No," she said, "your father is right. We make three rights. It works." But then she added: "Except when your father loses count." I was driving at the time, and I almost drove off the road as I started laughing. "Loses count?" I asked. "Yes," my father admitted, "that sometimes happens. But it's not a problem. You just make seven rights, and you're okay again." I couldn't resist. "Do you ever go for 11?" I asked. "No," he said. “If we miss it at seven, we just come home and call it a bad day. Besides, nothing in life is so important it can't be put off another day or another week." One September afternoon in 2004, he and my son went with me when asked to give a talk in a neighbouring town, and it was clear to all three of us that he was wearing out, though we had the usual wide-ranging conversation about politics and newspapers and things in the news. A few weeks earlier, he had told my son, "You know, Mike, the first hundred years are a lot easier than the second hundred." At one point in our drive that Saturday, he said, "You know, I'm probably not going to live much longer." "You're probably right," I said. "Why would you say that?" He countered, somewhat irritated. "Because you're 102 years old," I said. "Yes," he said, "you're right." He stayed in bed all the next day. That night, I suggested to my son and daughter that we sit up with him through the night. He appreciated it, he said, though at one point, apparently seeing us look gloomy, he said: "I would like to make an announcement. No one in this room is dead yet"
An hour or so later, he spoke his last words: "I want you to know," he said, clearly and lucidly, "that I am in no pain. I am very comfortable. And I have had as happy a life as anyone on this earth could ever have." A short time later, he died. I miss him a lot, and I think about him a lot. I've wondered now and then how it was that my family and I were so lucky that he lived so long. I can't figure out if it was because he walked through life, or because he quit taking left turns." Life is too short to wake up with regrets. So love the people who treat you right. Forget about the one's who don't. Believe everything happens for a reason. If you get a chance, take it. If it changes your life, let it. Nobody said life would be easy, they just promised it would most likely be worth it." And for a good laugh click here for waterbed testing in Germany. How to make a comment? Read annotation; click on it to enlarge. I absolutely enjoyed this delightful story, and it brought on a chuckle. Thank you, Werner, for sharing it. I thoroughly enjoyed this story. Cars have certainly come a long way, like everything else. 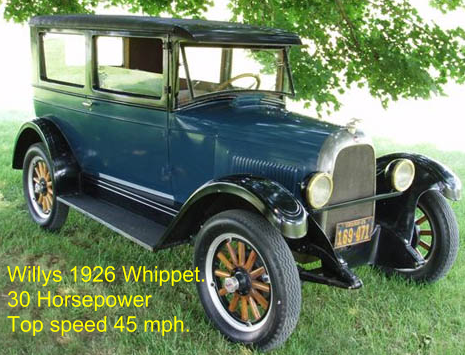 I have been thinking that if today’s cars had a top speed like this Whippet; fewer accidents would happen. I grew up in rural western Queensland and the story evoked memories of my youth when some people had a Ford T model and others did not. If I remember right; the cars had to be started with a crank handle. However, I think that the people who owned cars turned not only right but also left. :-) I enjoyed reading this story immensely, thanks, Werner, for sharing it. Who Can You Trust With Your Health?